L-com Global Connectivity, a preferred manufacturer of wired and wireless connectivity products, announced today that it has released a new line of mini-HDMI to mini-HDMI cables for video transfer applications. These new cables feature mini-HDMI type-C connectors and UL 20276, 34AWG cable. L-com’s mini-HDMI to mini-HDMI cables and are designed to support 4K and 1080p resolution video. They feature gold-plated contacts to endure repeated mating cycles and ensure superior connectivity. Additionally, fully over molded connectors provide excellent strain relief. The cables are offered in off-the-shelf lengths of 0.5, 1, 2 and 3 meters and can be used with mobile devices, diagnostic tools, gaming platforms, computer peripheral devices and in medical, military and professional AV applications. “Our new mini-HDMI cables are perfect for connecting HDMI host and peripheral devices together. These cables are built using the highest quality connectors and bulk cable the industry has to offer providing our customers with the highest resolution video available,” said Brian Gates, Product Manager. 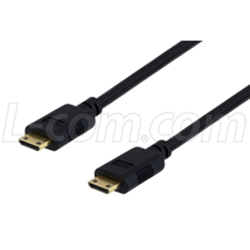 L-com’s new mini-HDMI to mini-HDMI cables are in stock and available for immediate shipment.